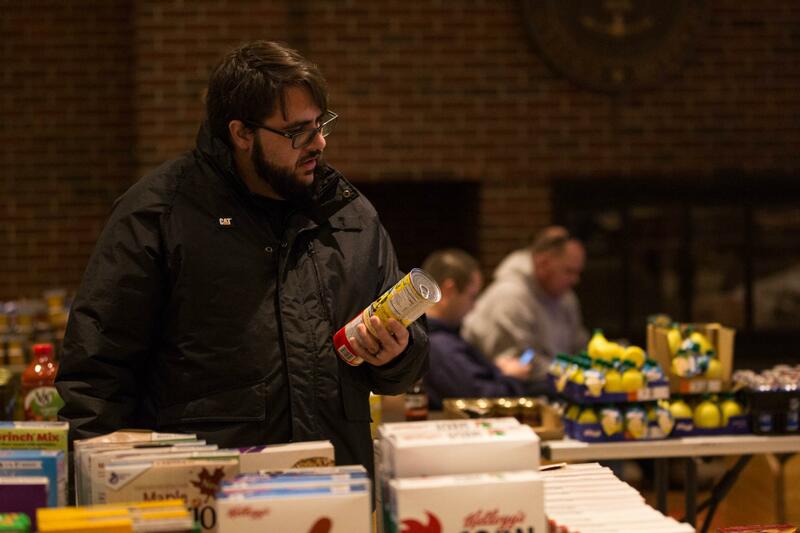 Petty officers Nick Saporito (left) and Joe D'Aleo (right) browse through donated items inside the United States Coast Guard Academy's Leamy Hall on January 16. Active-duty members of the Coast Guard aren't being paid during the shutdown. Outside of a hall on campus at the Academy, senior chief Brian Nichols grabs some food after volunteering to get his fellow service members fed. Coast Guard active-duty personnel and their families are benefitting from local food banks as they deal with the financial uncertainty of the government shutdown. On January 15, the Coast Guard workers missed their first paycheck since the shutdown started. Members of the Coast Guard don’t get paid during the shutdown because their service is a part of the unfunded Department of Homeland Security. Senior Chief Brian Nichols was standing outside of the Coast Guard Academy in New London. Normally, he represents the Coast Guard as a member of its band. He’s taking in donations, but he needs them, too. Nichols said he and his wife live “month-to-month” and had he not gotten this donation – and a loan with a zero percent interest rate from Navy Federal Credit Union – he doesn’t know where they’d be. “It’d be very difficult – we’d probably be eating a lot of Ramen Noodles,” Nichols said. Mike Brudzinski is a "Coast Guard Dad." He stays at home with his two children while his wife Miranda, a petty officer, works in the legal department at the United States Coast Guard Academy. Tables were laid out inside Leamy Hall and they were loaded with donations – everything from cereal to diapers to cat food. Miranda Brudzinski was volunteering there. She works in the legal department at the academy. Brudzinski’s husband Mike said that the shutdown’s forced them to cut back -- he couldn’t take his son to see Spider-Man: Into The Spider-Verse and that, when his daughter asked to go to McDonald’s, Brudzinski had to say no. A friend heard Mike talk about that on Connecticut Public Radio in a January 14 interview and reached out to Mike. “He’s like, ‘No shutdown’s going to take a kid away from his superheroes. And get that cutie some burgers,’” Mike Brudzinski said. The friend sent him money for the movies and food via Pay Pal. Brudzinski said it made him cry. Beer drinkers will not get to sample brand new creations from their favorite breweries during the government shutdown.